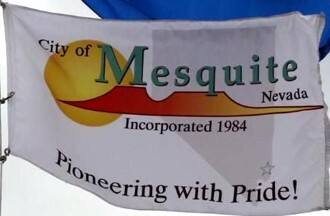 The flag of the City of Mesquite, Nevada, is white with city logo on it. The logo consists of a sun, a mountain, a map of Nevada, and letterings "City of MESQUITE/Nevada" "Incorporated 1984" and "Pioneering with Pride". The flag can be seen on a photo on Waymarking website :www.waymarking.com. About the city: "Mesquite is a city in Clark County, Nevada, adjacent to the Arizona state line and 80 miles (124 km) northeast of Las Vegas. As of the 2000 census, it had a population of 9,389, with a 2006 census estimate of 14,799. " - from Wikipedia : www.wikipedia.org.